The Flaming Carrot is back and ready for action! 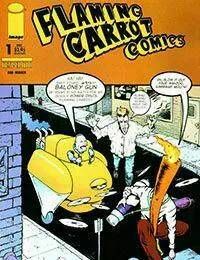 Armed with his not so trusty Baloney Gun he fights two crooks by the name of Garbagemouth and Bambo! Will he succeed or is his new weapon going to be the death of him?<br />This issue also features the rise of a tribal group of individuals known as The Pigmies, who are they, what do they want and why are they building a large replica of the human ear out of paste and french bread while in the middle of the woods?<br />(Note: This is issue 33 in the main series).